We had a double birthday this last week, meaning my mom and husband both turned a year older. To celebrate I made a homemade ice cream cake. We are not much of straight up cake and frosting people here, so an ice cream cake was a perfect dessert for the big party. It is really so simple to make... and in my opinion better and CHEAPER than Cold Stone or Baskin Robbins. 2. Let the cake cool COMPLETELY!!!!!!!!! 3. Cut the cake in half so that you have two 9 x 6.5 sized cakes. 4. Set out your ice cream. It is best to use the ice cream that is a rectangle block and comes in the cardboard. Don't let the ice cream melt and get soupy... just let it get soft. 5. Tear away the cardboard box from the ice cream. 6. Cut the ice cream in half long ways. This is tricky to do. It might take a little time. I used a piece of dental floss to cut it, and then finished it off with a big old knife that I have. 7. 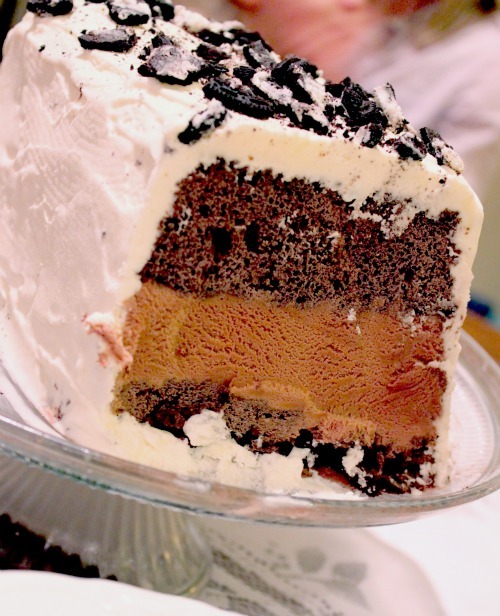 Place one of the cake halves on a cake stand then place one slice of ice cream on the cake. Cut the cake to the size of the ice cream chunk. 8. Quickly place the other cake halve on top of the ice cream. Repeat this as desired. Cover the unfinished cake with wax paper and place it in the freezer overnight. Save your left over ice cream. 9. In the morning, set out the extra ice cream. Let it get to the consistency of frosting... nice and creamy. 10. Quickly frost your cake with ice cream. Sprinkle crushed cookies or sprinkles on top. 11. Cover your cake with wax paper again. Place in the freezer until party time. 12. ENJOY!! It is so so so good, and well deserved after all that work! Love your blog and can't wait to try this! I love this. I can't wait to make my own ice cream cake. Thanks for the tips.